Holly's Horrorland: Krampus puts the Creep in Creepmas! complete with accessories and bad child! you can buy a paper puppet Krampus! 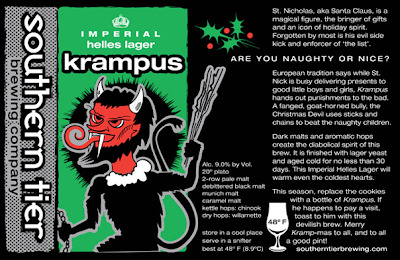 Bonus: Check out the awesome Krampus artwork here! happy krampus day... weird and creepy! That is such a super-cool paper puppet!! What a great selection of Krampus items. 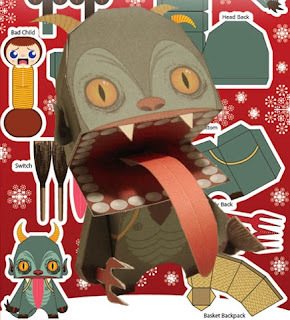 I love that the paper Krampus figure comes complete with naughty child!! Haha. Jeremy and Spooky - Thank you! 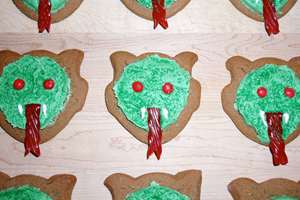 Hope you both had a happy Krampus Day too! Emma - Thanks! I loved the naughty child too! Wish they included more! lol. BeWitchy - Glad you enjoyed! I wish that was a real comic book. I'd buy it! Dr. Theda - Thanks again for the kind words and recommendation! Kweeny - Did you make him? If so, I want to see!